Give hand embroidery a try with this Airplane On the Go wristlet. 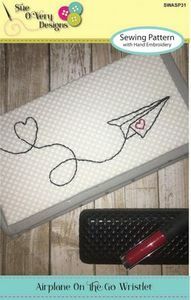 Adorable Airplane hand embroidery with heart details stitches up easy and is a perfect beginner project. Once hand embroidery is complete constructions is simple and easy to follow. Create a handle and bind this up for a perfect date night clutch. Final dimensions: 10in wide x 5-1/2in tall. Hand embroidery template included in pattern and easy to assembling.